In 2012, the format of the GMAT was changed slightly: a brand new section, Integrated Reasoning (IR), replaced the “Analyze an Issue” essay. Since its inception, we’ve learned a fair amount about the new section. The skills tested in the Integrated Reasoning section are actually the same skills you will use in the quantitative and verbal section, with slightly different emphasis. Integrated Reasoning, more than a standard quantitative question, will ask you to read charts and compare information quickly, rather than more purely testing your computational facility. Integrated Reasoning has twelve “items,” each of which will have somewhere between 1 and 4 questions. In order for an item to be scored as correct, you need to answer every question on it correctly (GMAT never rewards partial credit). The section is scored between 0 and 8, with one point awarded for each correct item. But weren’t there twelve items? Four of the items are experimental, meaning that the IR section has higher percentage (33%) of experimental content than any other section of the test. IR always appears as the second section of the test (after the Analytical Writing Assessment). GMAT allows test takers thirty minutes to tackle this section, or 2.5 minutes per item. This is very little time, and since the items can have multiple questions on them, many students find this to be the most stressful section of the exam. However, there’s good news. Because the IR section has the highest percentage of experimental content, you can more confidently skip difficult IR items. If you encounter a table, graph, or series of arguments that you know will take you five minutes, skip it. Allow yourself to skip one or two items per IR, to give yourself more time to focus on the other ten or eleven items. The other piece of good news about the IR is that it’s still unclear what value it is in admissions or how much weight business schools tend to give it. Because it tests the same skills as the rest of the exam, there’s a strong correlation between high composite scores and high IR scores, and low composite scores and low IR scores. IR differs from the rest of the GMAT in a few crucial respects. First, they provide a dinky on-screen calculator. That’s right - the only major standardized math examination that doesn’t allow you a calculator now allows you a calculator for IR only. Second, on questions that require you to do table analysis, you may sort the tables by columns. Be sure to take advantage of these tools. 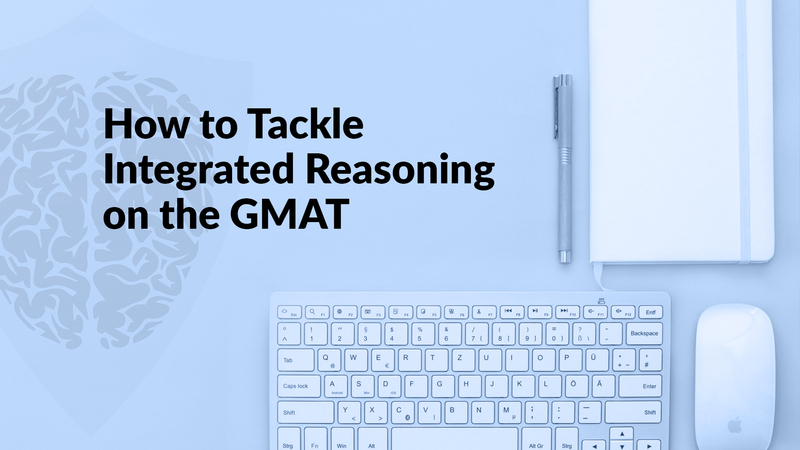 There are four item types on GMAT IR: Table Analysis, Graph Interpretation, Two-Part Analysis, and Multi-Source Reasoning. The first two types tend to be quantitative assessments, while the latter two types can be either quantitative or verbal reasoning. Table Analysis and Graph Interpretation are pretty straightforward: you are provided with a graph or a table and asked questions about it. You may need to calculate averages, percent change, ratios, etc. In other words, you’ll be asked to interpret the data and perform calculations on it; none of the tasks you will have to do are unique to this section. By preparing for the quantitative section, you’ll naturally cover how to do a lot of the computations you need to do on the IR Section. Two-Part Analysis is very similar to a standard GMAT question from the verbal or quantitative section. It differs in one crucial respect: you are answering two questions instead of one. For example, you may see a system of equations or coordinate geometry and the question will ask you to solve for both x and y. Each will have a column for you to select your answer choice. You may see an argument, and then be asked to find two answers: one that strengthens and one that weakens. Multi-Source Reasoning is probably the most reading intensive of the IR item types. You will have several tabs with information and will be asked questions about that information. Because of the tight time constraints, you don’t necessarily need to read all of the tabs right off the bat; instead, get a sense of what sort of information each tab has. Then, read what you need to answer each question. For example, you may see three tabs in which a buyer and seller haggle over a price, or three letters about what action the town should take to preserve local wildlife. To get some practice in the IR, you should acquire a new copy of the GMAT Official Guide. At the back of that book, you will be given a code and access to dozens of IR questions online on the GMAT’s website. Be sure to work through these items under realistic circumstances and to review your work. Zack Baldwin is a GMAT expert and senior tutor at Next Step Test Prep.